Brandt Snedeker is a well known professional golfer which comes from Nashville, Tennessee and who plays on the PGA Tour. He attended Montgomery Bell Academy and then went on to attend Vanderbilt University. Before turning professional Brandt won the U.S. Amateur Public Links in 2003 and went on to play the Nationwide Tour from 2004 to 2006. In 2007 he earned a PGA Tour spot for 2007 and was also named Rookie of the year. On July 28, 2013 Brandt won the RBC Canadian Open, his sixth PGA Tour victory and second of the 2013 season.His corporate partners include Mastercard ,Bridgestone Golf ,Adidas ,Wyndham Worldwide and Marquis Jet. Brandt enjoyed a banner year in 2012 which included a victory at the Farmers Insurance Open in January and was capped by winning the 2012 Tour Championship, 2012 Fed Ex Cup & being named to his first Ryder Cup team. In his quest to make U.S. team Brandt played his best golf of the season including Top-6 finishes at the British Open, Barclays, Deutsche Bank Championship & Tour Championship. He has not slowed down in 2013, picking up Top-3 finishes at the Hyundai TOC, Farmers Insurance Open, Waste Management Phoenix Open and another win at the AT&T Pebble Beach Open. This blazing start moved him inside the Top-10 in the OWGR for the first time in his career and has him poised to continue that climb throughout 2013. In 2011, Brandt reached career highs in top 10 finishes, with seven; earnings, with $3.6 million; and reached a career high world ranking (OWGR) at 24th. Brandt captured his 2nd PGA TOUR victory at The Heritage with a playoff win over #1 world ranked Luke Donald. Brandt had a great start in 2010, including a runner-up finish at the Farmer’s Insurance Open and his season included T-8th finishes at the U.S. Open & Wyndham Championship. That year he made over $1.5 million and gained exemptions to the 2011 Masters and U.S. Open. He finished 37th in the FedEx Cup points standings. Snedeker also closed 2009 with a bang by finishing in the Top-10 five times and the Top-5 three times in the second half of that year. Brandt made $1,483,557 placing him 55th on the final money list, and 33rd in the FedEx Cup point standings. In 2008, Brandt had five Top-10 finishes including a 3rd place finish at the Masters and a 9th place finish at the U.S. Open. That year he was selected to the World Cup team with fellow American, Ben Curtis. In 2007, Brandt racked up six Top-10 finishes, including a win at The Wyndham Championships. At the Buick Invitational, Brandt tied the Torrey Pines North Course record with an 11-under par 61. His 9-under 27 on the front nine tied a PGA TOUR record. Brandt’s peers voted him Rookie of the Year, and his earnings of $2.8 million are the largest ever by a rookie. He finished the regular season 9th in FedEx points, and is only the 15th rookie to ever qualify for The Tour Championship. 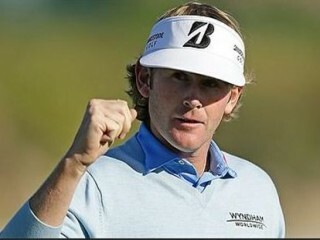 View the full website biography of Brandt Snedeker.